WILL THE HALF SHELLS BE WASHED UP ON THE BEACH? Sun. Sand. Surfboards. Shredder? Talk about a party pooper. The Teenage Mutant Ninja Turtles try to take up a vacation only to have it cut short by Shredder's shadiest sham yet. He'll stop at nothing for revenge. This time that ice-hearted anti-hero made off with the entire island of Manhattan. His sinister alien ally Krang has given him the technology to rip the bustling borough from its earthly ties with a rumbling earthquake and lift it into the sky. If our holiday heroes ever want to see April O'Neil and the Big Apple in one piece again, they've got to burn rubber and get back home! Getting back to Manhattan will be no smooth sail. You'll have to use every modus travelus imaginable, including jet surfboards, a battleship, a blimp and your own ingenuity. Here's why. Shredder's set up dastardly detours every inch of the way with the most mindless meat-ripping maniacs ever to have a taste for turtle. And he's taught them quite a few new treacherous tricks. The burliest beasts of all await at the end of all 8 totally awesome levels. But keep that melon of a chin up; you've got some stunning new moves yourself. You can take out enemies and rack up points for the good guys. So suit up with the turtle of your choice and prove that crime and late pizza deliveries never pay. --From the NES Teenage Mutant Ninja Turtles 3 instruction manual. Play Teenage Mutant Ninja Turtles 3 Now! After a victory over their nemesis, The Shredder, the Teenage Mutant Ninja Turtles decide to go to Florida to take a vacation. While watching television, they learn that Manhattan is being pulled into the sky by a giant spaceship! Like always, the Turtles grab their weapons for another adventure! Teenage Mutant Ninja Turtles 3 is similar to the other TMNT games in terms of graphics and sound. Well, the music and sound effects are all recycled, so it gives the series some continuity. At least they're good music and sounds (Slash! Pow!). The characters are drawn and animated well, and the backgrounds are nicely done as well. 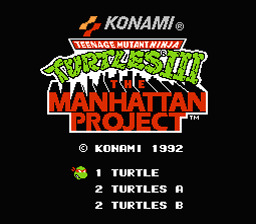 This game is very similar to the other games, so if your a fan of the Turtles' NES games, you pretty much know the drill. If you press A and B together, you can execute a special attack. Each turtle has a different one. If you die, you can select a new turtle if you want or keep the one you selected. Either way, you'll still lose a REST. You'll run into a boss at the end, so be ready for anything he'll dish out! While on the title screen, press Up, Up, Down, Down, Left, Right, Left, Right, A, B, Start to activate the Stage Select!